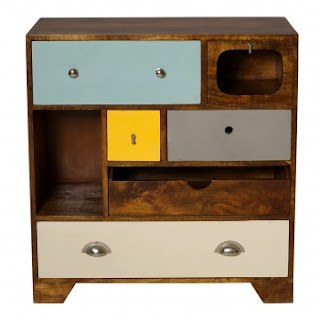 the cabinet after refurbing - so cute! For a few weeks in February I was lucky enough to have some assistance from the talented Sophie Donaldson, (former fashion marketing student and future high flying lawer) Those of you who came to the Pop-Up Shop might have seen her whooshing around with cakes and a clipboard. She helped me with my marketing, and in return I offered to help her with some furniture renovating. We found a little dressing table in a second hand shop in Mold and Sophie decided to take some inspiration from Oliver Bonas and paint the front of the draws in different colours. 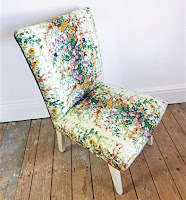 For Christmas Sophie was given my Country Cottage floral bedroom chair as a gift and so she selected the colours from the greens in the print. The pewter finish handles came from an online hardware shop and although cost more than the dresser itself, we thought they really made it!